The Ngāpuhi leader Ruatara translated Marsden’s sermon. The two men had first met in Port Jackson (Sydney) in 1809. In 1814 Marsden sent Thomas Kendall to consult Ruatara about establishing a Church Missionary Society (CMS) mission at his kāinga (village), Rangihoua. 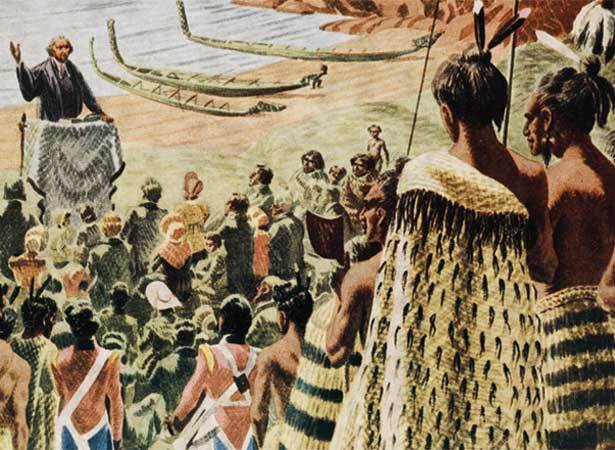 Ruatara assumed the role of protector and patron of ‘his Pākehā’ – the CMS lay missionaries Kendall, John King and William Hall, who had arrived with Marsden on the brig Active on 22 December. A site for the mission station was chosen the following day. After cattle and horses were landed, Marsden rode along the beach to the astonishment of Māori onlookers. The day after Marsden’s sermon on the significance of the birth of Jesus, the Active left Rangihoua to obtain timber with which to build the mission station. By 13 January the missionaries, their wives and all their stores were ashore and a large hut had been erected. Ruatara’s death in early March left the future of the mission uncertain. We have 20 biographies, 5 articles, related to First Christian mission established .